Welcome to Kijitei Hoeiso. This Traditional Ryokan was constructed over 300 years ago and was moved from Hida Takayama 50 years ago where it was given a new life as a ryokan. The location of the ryokan was carefully selected due to it surrounding nature and river views. Kijitei Hoeiso has 18 rooms with private indoor hot spring baths and a hanare (private guest residence) without a private bath though you can bathe in one of the ryokan's open air hot spring baths and enjoy the views of the river as it flows on by. The rooms have either garden, mountain or river views and meals are served in your room. The ryokan is about a 10 minute bus ride from Hakone-Yumoto Station. My husband and I spent 1 night here on our honeymoon. The service is outstanding. Everyone was so extremely kind and helpful. Front desk service has excellent English skills and we were allowed to leave our bags at the front desk until check-out time (we arrived in the area super early). By the time we got back to the inn, our bags were already in our room waiting for us. The indoor and outdoor baths were wonderful. Everything is very clean and easy to use. The grounds at this onsen are spectacularly beautiful and worth strolling around. There is a bus stop literally outside the front door. But be sure to let the front desk know if you are trying to catch one because they have to turn on a little blinking light; otherwise the shuttles won't stop (we learned the hard way). The food was delicious but as other reviewers have said, you have to come with a very open mind and adventurous pallet if you are not used to traditional Japanese food. There was definitely plenty of it though; we didn't feel hungry at all and in fact had trouble finishing it all! The futons are surprisingly comfortable, so if you are worried about sleeping on those, don't be. I have lots of back issues and my husband is a generally poor sleeper and we both did great on them. We would love to revisit if we're ever lucky enough to visit Hakone again. I definitely recommend these small ryokens over the big resorts, but that's just my preference. I must say that, we had a good experience overall, the service in the room and the dinner were really nice and the outdoor and indoor onsens were good. But I was disappointed by the building, which wasn't an old building at all. They do have an ancient building separately, but the actual room where we stayed was in a concrete building from the 60s, and not so well kept. Also we had a view on a concrete slab, not really astonishing..the definition "traditional ryokan" seems a little deceiving..
My friends and I spent one night at Kijitei Hoeiso, as our first time in a ryokan, and it was a highlight of our two weeks in Japan. We had had a long day traveling from Tokyo to Hakone and doing the complete circuit touring Hakone (train, boat, gondola, bus, etc), and were tired and stressed by the time we returned to the guesthouse for the evening. That quickly disappeared as we changed into our yukata (after seeing us, the attendant came back with a shorter one for me and a longer one for my tall friend! ), were served tea, and sat down to one of the most elaborate meals of our lives. There were some new-to-us elements (pheasant sashimi!) along with some more familiar flavors, all presented with great care. We also managed to try both the indoor and outdoor onsens during our visit – the outdoor was especially nice because the cool air keeps you from getting overheated so quickly. Overall, highly recommended. We had such a nice time at Kijitei Hoeiso. The setting is beautiful and the property was very relaxing and comfortable. The staff were so friendly and welcoming, and served us excellent meals including vegetarian option. The Onsen are great and so atmospheric, and it was nice to be able to book privately. Thanks so much! This was our first time in a ryokan. While the staff spoke limited English, they were nevertheless very accommodating, friendly, and courteous, and provided impeccable service. The location is beautiful, with the backdrop of mountains and lush, green forests. The room was very nice and spacious, and it was our first time staying in a "Japanese-style" room with tatami mats and futon bedding. It was very comfortable, but my partner wasn't used to sitting in the lotus position for meals! Speaking of the food, I found it all quite delicious; the pheasant was very unique as I've never had it as sashimi before! However, because it's a kaiseki-style meal, you'll need to approach it with an open mind and broad palate, because if you're accustomed to a particular type of cuisine, you might find some dishes to be a bit exotic in preparation (picky eaters, take note). Lastly, the hot spring was indeed incredibly relaxing, despite only being able to withstand it for about 20 minutes before needing to get out. We booked a private session, which meant we got the onsen all to ourselves at night! It was really relaxing to hear the river right beside it. The grounds themselves are also very beautiful to stroll along, despite the fact that it was a rainy day. Wish we could have stayed for more than one night to fully take everything in, after a whirlwind tour of Hakone! Definitely a place I'd recommend staying if you're looking for a great ryokan experience. 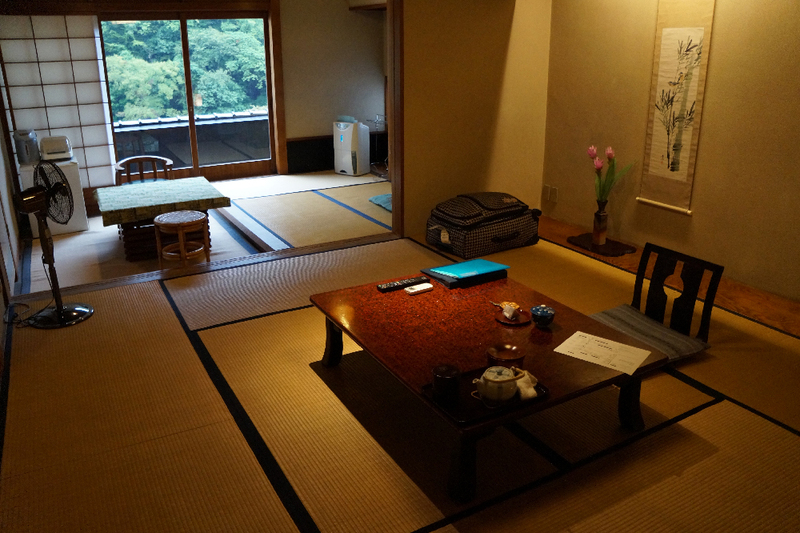 If you want to go to Japan as couple you should stay in this ryokan at least 1 night. Private onsen usage was awesome. It was so romantic. Even bath inside ryokan was perfect. Rooms were big and view was peaceful. Staff was genial. They felt us like at home. If breakfast include at least bread and cheese everyone would be satisfied. Eating fish in breakfast is not everyone's charge. Location is good. When you get of in Hakone-yumoto. Take the K bus line and get of at Kuzuhara. It is in front of the ryokan's gate. We enjoyed a one night stay at Hoeiso. After 5 days in Tokyo and 4 in Kyoto we were ready to decompress in a quiet beautiful spot. The staff was very kind and accommodating. Our hostess was graceful and made us feel welcome and at ease during tea and during each meal. The beauty of the environment, onsen baths, and delicious food felt like a gift, and one that we will never forget. When the bus arrived to bring my husband and I back to the train station, three staff members came outside to wish us well. They all bowed and waved with smiles until we were out of sight. I looked over at my husband and we both had tears. What a wonderful place with wonderful people. We hope to be back again! My friend and I had an incredible experience at Kijitei Hoeiso. We had just finished a 10-day teaching program in Tokyo and what a retreat to the mountains! This was exactly what we needed - beautiful ryokan, onsen with stunning views and location right next to the river, exquisite food - we couldn't have asked for a better experience after the crowded, busy city experience. Less than 24 hours and we were rested, refreshed and ready for the next part of our Japanese experience! The staff were so friendly and helpful which really added to the experience. Thank you!! If I come back to Japan I will definitely be staying here again. Awesome Ryokan, really friendly colleagues, the Onsen was the best, at the fresh air in front of the river and within an area surrounded by nature. If we would go to Hakone again, we would rather forget about all the Free Pass trips and spend more time at the Onsen. But I must admit that the Tee House on the way to Moto-Hakone was really nice as well. We stayed here for one night. Everything was lovely and we enjoyed our stay. Staff was very friendly and helpful. The mountain view from our room was amazing. I had ordered a vegan menu and everything was very tasty. Would recommend to anyone. Staying at Kijitei Hoeiso was an amazing experience. The staff there are so hospitable and helpful, and we really appreciated our room attendant, who made us feel at home and welcome. Everything was so tranquil and authentic. The outdoor hot springs in the garden were wonderful, and afforded a great view of the neighboring mountains. When I am in Japan next, I'll definitely try to return. The Ryokan’s staff is very welcoming and kind, the structure is a little bit old but very clean and well kept. The outdoor private bath has a fantastic atmosphere. The typical cuisine is very well presented,tasty but in some cases a bit particular for European taste. Very nice stay at Kijitei Hoeiso. The staff is very polite and helpfull. More information and instructions in english about booking/reserving the outdoor/family baths would have been good. Everything did, however, work out fine despite the lack of instructions. The location of the ryokan is fairly good, though it is not very pleasant to walk anywhere from the ryokan which is a shame. Absolutely beautiful. The location is amazing, the outdoor baths in particular are so peaceful -- they're right by the river. The scenery is gorgeous, particularly during cherry blossom season. The room was very nice, very comfortable. The hospitality was amazing -- everyone was so kind to us and made us feel very welcome. I'd definitely recommend staying here, it's sure to be a relaxing and beautiful time. The cherry blossom was in full bloom about 8 trees. Fire pit at nice is very nice. The food is really good. There is our door and in door onsen. At night you can reserve private onsen. Everyone is very nice! After 6 days of flights, train hopping, and walking through the big city, Hoeiso was the perfect getaway to relax and recover. Being as this both was my first visit to Japan and staying in a ryokan, I can't say how it compares to any other ryokan. But my friends and I thoroughly enjoyed ourselves. The location is scenic, the onsen was relaxing and well maintained (both indoor and outdoor), and the rooms were clean and comfortable. I don't know what else someone could ask for. Our room attendant (Koba) was friendly and attentive, doing his best to explain washoku to 3 foreigners. Personally I thought the food was great, and served in our room! Very cool. The entire bill for 3 people was about 120,000 yen for 2 nights, which breaks down to about $200 per person per night. Would love to visit another ryokan to see how it compares, but it was an affordable luxury we needed to counteract the breakneck pace of the rest of our trip. My sister and I, with our partners, stayed for one night in the middle of our trip and it was the perfect little escape from the hustle and bustle of Osaka and Tokyo. The staff spoke English very well and were very helpful with arranging the bus back to the train station. Our room attendant was fantastic, making us tea, dinner and breakfast in the room. The dinner was wonderful, lots of items we wouldn't have ordered normally so it was great to try something different, especially the pheasant sashimi. All of it was very tasty. Breakfast was a traditional Japanese style breakfast, so again very different but a great experience. The outdoor onsen was beautiful. As we were there in winter it was cold outside but it was beautiful in the hot onsen, with a beautiful outlook on the stream going past and even some wildlife on the other side. The indoor onsen was steamy and hot and very relaxing. Our room was large and spacious, perfect for the four of us. We had a short but amazing stay at Kijitei Hoeiso. We would definitely return! We have visited many 5 star hotels around the world, and also have had bed and breakfast stays. Our experience here was so very unique, truly Japanese. It was a cultural experience as much as a relaxation and culinary experience. I went there with my wife and 3 children. They had never been in a Onsen before but absolutely enjoyed it. We stayed there for one night and the kids went to the ryokan 4 times, one in afternoon (indoors), one at night (outdoors), and then again the morning. The food was terrific for the adults, it's an acquired taste for Japanese foodies, the children did not enjoy all the dishes for it's exquisite variety. But they loved the service, the experience of it all being served delicately and artfully presented by one of the hotel staff dressed traditionally. I have no complaints, it is very peaceful, the rooms were authentic thus not Western luxurious. The staff spoke English sufficiently well. Just an amazing experience! A wonderful way to complete our trip to Japan! Great service, food, lovely grounds, very calming and traditional. Large, traditional ryokan visited off-season, so quite quiet. The hotel itself is a little worn, but nonetheless very nice and comfortable, and warm, despite the cold December weather. Stunning views of the valley and old, but lovely public baths. It was particularly nice to enjoy the outside bath with a private reservation. The food was delicious, and the staff delightful. You probably need a car here to enjoy the area best, although local walking is possible and the nearby town is attractive to visit. Très facile à trouver depuis la gare (prendre le bus K) l'arrêt se situe juste devant le ryokan. L'entrée est spacieuse avec une très belle vue sur la montagne et la dépendance. Toute la structure est traditionnelle ce qui apporte une touche encore plus concrète de dépaysement mais surtout de calme. Le personnel est à l'écoute, attentif, et parfait. Le bain intérieur est parfait pour commencer cette petite parenthèse de détente, les produits pour se laver sont de qualités. Le repas fut délicieux, pas de mauvaises surprises, tout était bon ! Puis réservation de 30min du bain extérieur et même s'il pleuvait on a tout autant profiter. C'est juste un endroit magique et véritablement relaxant. Le réveil a 8h peut sembler tôt mais c'est parfait pour profiter de sa matinée. Petit déjeuner traditionnel mais très bon et copieux surtout ! Puis on est retourné au bain extérieur puis intérieur avant de repartir. C'est vraiment un endroit que je conseille et où je retournerais volontiers ! 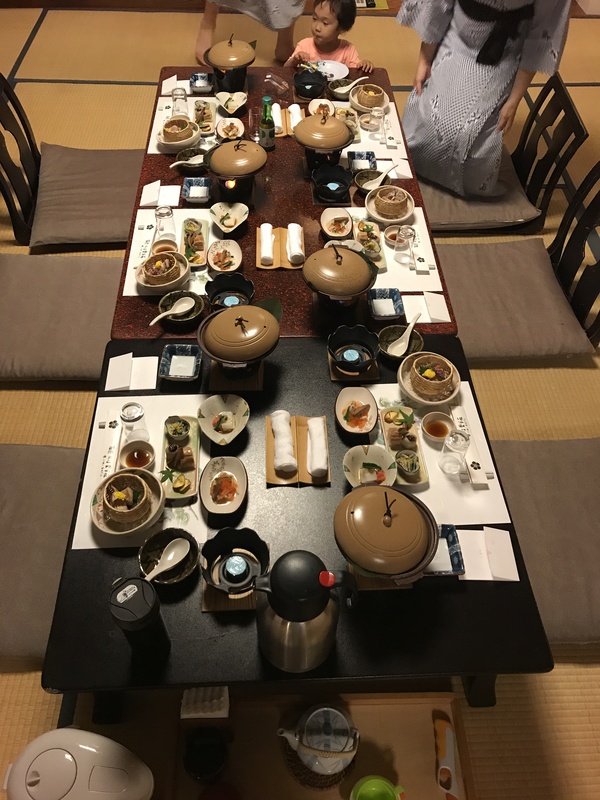 This was our first stay at a Ryokan and we found it amazing! The staff is very nice, the place is beautifull and the food is both delicious and very well presented. The outdoor onsen is really as beautiful as the photos! It was magical, worth every penny! Spent one night at Kijitei Hoeiso, which was our first ryokan experience in Japan. We enjoyed it so much! The inn was really clean, the staff friendly, and we enjoyed the indoor and outdoor onsens which were pretty big. The one unexpected downside was our in-room onsen, which was really just a super small bathtub that we ended up not using at all. If you're looking for a relaxing night in Hakone at a Japanese inn that isn't outrageously expensive, this is a good option! This was our second stay at a Ryokan after a wonderful stay at a temple in Koya-san and unfortunately it did not meet our expectations. The only traditional building is the cottage house, the rest is a hotel with traditional-like rooms that was dusty with visible wear and tear on the closet doors, tatamis and toilet floor. Though the meal are served in the room, the food was not fresh and not particularly good. We did enjoy the outdoor onsen although someone took our reserved spot. Superb all-round experience. From the moment we step foot into the reception area, we felt calm and relaxed. While not all the staff speak English, they made every effort to make us feel comfortable. One of them, in particular, had good English and was very accommodating and went the extra mile in telling us about the Hakone area and it's attractions. The location was nice and had a good view of a mountain from the window. The outdoor onsen, at night especially, was tranquil and refreshing. The room was in good condition and provided us with a good Japanese feel - which is what we were hoping for. All in all, the stay at Hoeiso was as good as I could have imagined it to be! This place was so beautiful and the staff were wonderful and very friendly and helpful. The open-air baths were so relaxing and the food was just AMAZING! Highly recommended! The location is beautiful, and with a bus stop directly in front, it's easy to get out and see the region. Staff were very friendly. We loved the outdoor baths, and the food was the best we had in Japan! Stayed here with a group of 4 and it was one of the best parts of our trip! The staff were so lovely and helpful and the owner himself took a lot of time and care making sure we were happy. The area is breath taking and we couldn't have asked for more, highly recommended! The food was great! The weather was great! The area is beautiful. The ryokan was nice an the staff was friendly and spoke good English. They even rent to 1 person. The indoor and outdoor baths were awesome. I could live there. After having a nice dinner then bathing in front of the river in the outside bath, I felt totally relaxed. Definitely going back! Great food, very nice staff, very confortable futon (that's not everywhere!) a beautifull onsen - outside. Even if it is a little bit expensive for a single room, the price is justified. Something that you have to do; somewhere you have to go! This place was amazing. Fantastic. Gorgeous. Breathtaking. There just aren't enough words to describe it. The food was top notch and crossed the line between cuisine and art. What really made me happy was that when I arrived (limping along on crutches and weary from a day spent traveling), they didn't ask my name or take my credit card info. They knew who I was and they got straight to work making me comfortable. There was only one complaint for me, and it's really not their fault. I'm huge, built like an NFL lineman. The ryokan was not very well equipped to handle someone of my size. The house slippers were all comically small compared to my feet, which led to me walking around in my socks the whole time, and even their largest Yukatta (3L size) was far too small. The staff did not make any issue out of either thing, and nobody gave me any grief about not wearing proper attire. If you are a gargantuan specimen of humanity, you should bring your own robe and slippers. The futon bed was too short for me, but the staff put down an extra futon next to it so that I would be comfortable, and I didn't even have to say anything. I snuck out for a late night soak in the outdoor bath after hours, and while I would *never* recommend that anyone break the rules, I enjoyed it immensely. One thing that I would recommend is that when you arrive in Hakone Yumoto station you go to one of the nearby shops (Even if it's just the 7-11 on the corner there) and pick up a few beverages and snacks in case you don't want to incur charges for the minibar in your room. I loved it! I stayed in a Japanese style room. Very rustic charm with a view of the river and Japanese garden. The bus stop is in front of the ryokan and about 15 minutes from the train station, so it is easy access to travel out and see the sights. The Onsen was great. The staff speak very good English and are very accommodating. The only negative thing I have was that I saw a good bit of dust in the bathroom, but being 198cm tall I cannot complain about it. All in all I say that it is well worth it to stay there. I plan to go back if I ever have the chance to! Very nice place to stay. All staff were very pleasant and helpful. Great customer service. Nice views of the running river right next to the outdoor bath. Food was excellent, very nicely prepared and nicely presented! Very clean! This place was a perfect way to end a 2 week trip in Japan. The food (dinner & breakfast) was amazing, from presentation to palate! The facilities were clean and quiet. The outdoor onsen was a nice, short walk to the riverside but worth it, as you can hear the sound of the river going by. The staff is friendly and made sure we were always comfortable. They did speak some English too. Worth every penny! Kijitei is an ideal place to stay as an escape from the buzzing city life. Its tranquil and painting-like surroundings together with the authentic Ryori being offered gives you an illusion that you are living in the fairy tale. My special thanks goes to Chihiro whose attentive service made me feel at home. My wife and I stayed two days/nights at Hoeiso after four busy days in Tokyo. Definitely worth it! The beauty and tranquility of the ryokan offered a perfect respite, and the meals and service were fantastic. Great location, wonderful staff, and a thoroughly enjoyable visit. The only word I would use to describe this ryoken is "wow". The service was excellent, the food delicious, the scenery beautiful and the baths relaxing. I would not hesitate to recommend this ryoken to anyone, and would even like to go back to Japan just to re-vist. On arrival I was taken to my room and served green tea. I was instructed to remove my main shoes in the lobby, and then my slippers when I entered my room (different slippers were provided). Later dinner was served in my room and, after I had finished, the table was cleared and my futon put down. If you're really shy and not used to Japanese culture you might find this a bit awkward/odd if you're travelling alone but I would recommend you relax and enjoy it! I spent several very relaxed days here, enjoying the tranquility of the location, the lovely setting, the relaxing hot baths (indoor and out), and being treated like a princess. I have stayed in ryokan before, so knew what to expect regarding customs and meals; here the personal attention and beautifully presented fresh and seasonal food were outstanding. The staff were very tolerant of my attempts to communicate in Japanese, then coped splendidly when I failed. My requests concerning diet and the volume of food were gracefully accommodated (I had to ask for the evening meal to be cut by half as the first was so generous). I enjoyed the pretty garden, although would have liked to be able to walk further from the hotel - the busy road prevented this, but did make getting about the interesting and attractive area very easy. I worked my Hakone Free Pass very hard! We were in Hakone during the typhoon, so one would think that we didn't have a great time there. On the contrary, my husband and I absolutely loved Hoeiso and Hakone. Hoeiso is clean, spacious, the staff is incredibly friendly and I can't even begin to describe the food. No where else during our trip in Japan were we able to taste fine traditional Japanese cuisine and we loved it! The food definitely introduces new flavors and textures that we wouldn't know to look for in a restaurant or on the street. The lady that served our meals was very sweet and kept apologizing for her English although I thought her English was very good. The location is great, just a few minutes by bus from the main train station. We were so happy with our choice of hotel in Hakone. We arrived tired and hungry. And left feeling amazing. This was the only place we booked before we arrived into the country and it was worth every bit. On arrival we were warmly greeted and shown to our room. It was amazing with a beautiful view out to the forest and the sounds of the river gently floating up. Our hostess was absolutely amazing - she was very attentive to our needs and provided not only spectacular service but also provided great conversation. No small feat with the language barrier. Our stay at this ryokan can easily summarise our entire trip: Amazing elegant and the best service we have ever experienced. We stayed here for one night in early aug (25 year old couple) and enjoyed our stay. The rooms are large with plenty of space and the beds are comfortable. The indoor women's spa was nice and we were able to reserve the outdoor spa privately. Dinner and breakfast was large and good. We stayed two nights here and loved the experience. After running around Tokyo for 4 days - we welcomed any excuse to slow down. Hakone is a beautiful town, and Kijitei Hoeiso was an incredible way to experience it. We enjoyed all of our meals, the shabu shabu and tempura being our favorite. We also enjoyed the use of the private outdoor onsen in the evening. Highly recommended. We stayed one night and had a great time. We felt very welcomed by staff, traditional rooms are confortable and spacious and dinner was also such a nice experience. One differentiation is the opportunity to have private family baths in addition to public onsen, perfect time to relax during the evening with your family after a full day in Hakone. Together with my wife and daughter, I had a wonderful stay at this ryokan and it was a truly marvellous experience for us, especially the dips in the hot baths, both indoor and outdoor. The food was indeed very beautifully presented and tasted great too. After a long day visiting the sights of Hakone it was a relief to wind down in a placid and comfortable place that is Kijitei Hoeiso. Antiguo, con olor a tatami y a montaÃ±a. Encontramos la experiencia del antiguo JapÃ³n que estÃ¡bamos buscando con un trato exquisito y una situaciÃ³n de ensueÃ±o. Nos dieron una habitaciÃ³n con vistas a la montaÃ±a y pudimos reservar para nosotros solos el Onsen, que disfrutamos tras una cena maravillosa servida por nuestra propia asistente. Solucionaron todas las preguntas que tuvimos y nos trataron con toda la galanteria y amabilidad que solo el pueblo japonÃ©s tiene con sus invitados. Gracias. ******** This ryokan experience was marvellous. After a 15 days tour walking everywhere in the enormeous cities of Japan, we arrived to Hakone looking for the peace and traditional experience of the old Japan. The Hotel is old, you could smell the tatami and mountain everywhere. We found the experience of ancient Japan we were looking for in an exquisite and dreamlike situation. We got a room with mountain views and we reserve the Onsen only for ourselves, which we enjoyed after a wonderful dinner served by our own wizard. They solved all the questions we had and were treated with all the gallantry and kindness that only Japanese people have with their guests. Thank you. What an amazing experience. Total relaxation and rest. The staff was dedicated to providing the most wonderful experience for us. Changing in the hakata and obe sets the stage for relaxing. Our personal attendant, Kokoru, was spectacular; courteous, wonderful sense of humor, attentive, gracious, and professional. She made tea for us, along with breakfast and dinner in our room.The food was superb. The outdoor hot spring pool was magical. This was our second time in a Ryokan, the first was in Osaka. I would say that Hoeiso Hakone has definitely raised the bar. It was absolutely beautiful overlooking the colourful mountains in Fall. We had our own balcony, a big living room, a room for dining and the other for bed. Our private toilet was separated from the private shower. The room was even equipped with 2 sinks!! The staffs were extremely friendly, speaks English so no language barrier when it comes to enquiring about the food on our table to taxi services. Private relaxing outdoor bath overlooking the river is available for booking at no cost. My partner and I enjoyed our stay at Hoeiso very much! !